Elaine Davis brings you decades of experience working with horses and people, and is a seasoned and ordained Minister, a Trainer of trainers in EAP/EAL and FBEAP, and an inspirational Speaker. As the founder and President of Unbridled, LLC, Elaine has helped hundreds of people find healing and freedom through equine experiential learning on her ranch, Unbridled!, and also on location around the country. 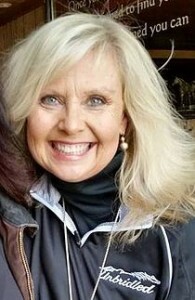 She has gone on to develop Faith-Based Equine Assisted Philosophy (FBEAP) and developed The Stable Guide ™ Series – Seminar Certifications to teach FBEAP and to equip and certify FBEAP Facilitators and Trainers. In 2012, Elaine founded the FBEAP Association to serve the growing FBEAP movement. For information on membership in FBEAPA or to follow the growing conversation among FBEAPA members, please visit the FBEAPA Online Community. Elaine established Unbridled™ in 2005 has been leading Equine Assisted Learning Certification Seminars since 2007.